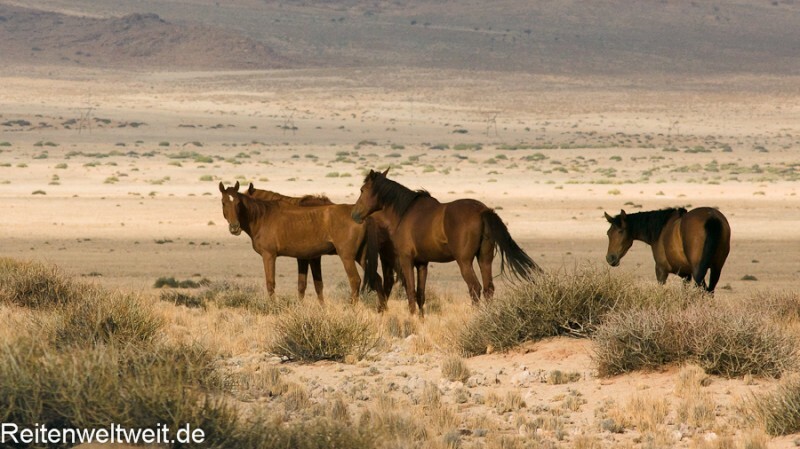 How did these wild horses get there? The sun relentlessly scorches this amazing desert landscape of the Namib Desert – it is hard to believe that any creature can live at temperatures of around 45 degrees for any length of time or even survive. But they managed to do just that: The wild horses of Namibia, the Namib Horses, have lived in this area for more than 100 years and without any human assistance. These feral horses were able to develop in almost complete isolation, and today we can speak of them as a separate breed, the “Namibs”. Where did the Namib Horses come from? The answer to this question was controversial for a long time. It was certain only that there were originally no wild horses in the Namib Desert, therefore the horses had to have been introduced with human help. Some believe that they originated from a cargo ship, loaded with horses and other livestock that arrived in the late 19t century about 25 km south of the mouth of the Orange River (200 km from Garub). Others mention the horse breeding station of Hansheinrich von Wolf (at Duwisib Castle, 250 km northeast of Garub). But a farm manager was continuously stationed there in the First World War during Wolf’s absences and after his death. 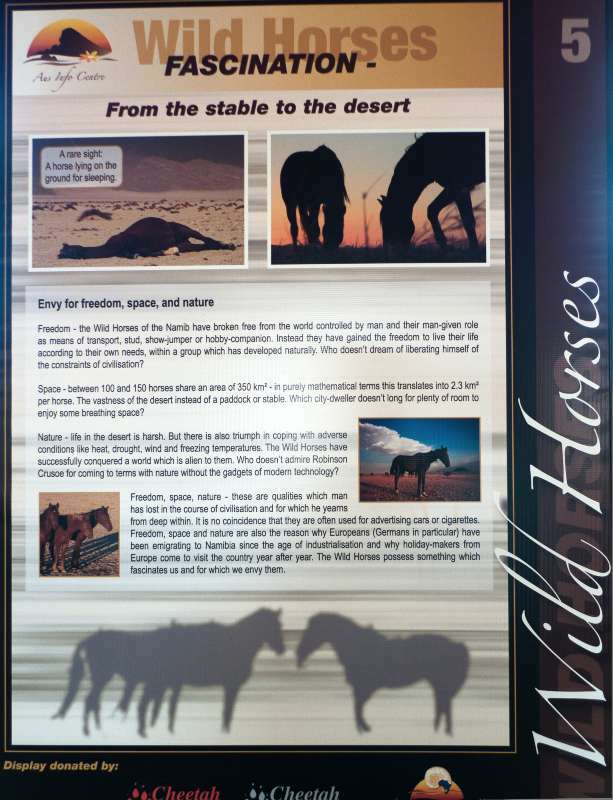 Nothing in the books indicates that any horses had gone missing even into the late thirties, whereas the wild horses near Garub were mentioned in the 1920s already. 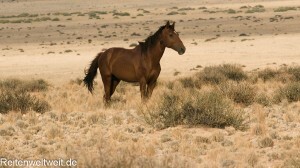 It would be unusual for horses to cover such great distances as they normally tend to stay in the area they know. 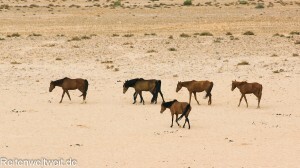 Therefore, it seems likely that the wild horses were originally from the region of Garub and Aus and the first two theories put forward are incorrect. 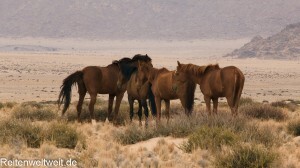 A few stray horses can hardly have been the basis for the herd that exists today as their diversity of characteristics and herd size suggest a rather large initial group. Another theory mentions that the German Schutztruppe had about 2000 horses (probably Trakehner) stationed near Aus during WWI and when they had to retreat before the South African troops, they just left behind their horses. However, the retreat for the most part, was carried out in an orderly manner. At the same time some reports state that there were even more horses in the area: 10,000 South African soldiers with their 6,000 horses had set up camp near Garub in March of 1915. A dug well existed at that location. It supplied water for the steam engines at the nearby railroad line. 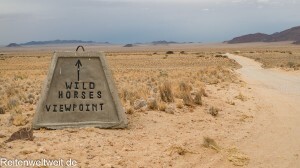 This means that there were about 8000 horses in all in at the edge of the desert within a 30 km radius! 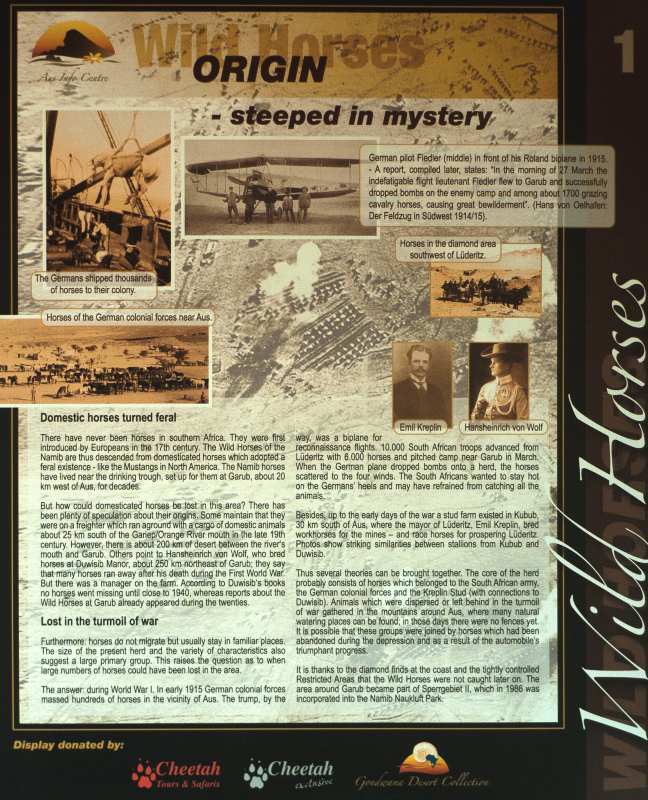 A military report, compiled later, states: “In the morning of March 27, the tireless flight lieutenant Fiedler flew to Garub and successfully dropped bombs on the enemy camp amidst 1700 grazing cavalry horses causing great confusion” (Hans von Oelhafen: Der Feldzug in Südwest 1914/15, Berlin 1923, page 117). As the South Africans were about to start an offensive and in a hurry to stay hot on the heels of the retreating German soldiers some of the scattered horses might have been abandoned. Additional evidence completes the picture: The amateur historian Walter Rusch discovered photo albums of Emil Kreplin, mayor of Lüderitz between 1909 and 1914. He found photos of a stud farm in Kubub, south of Aus. Kreplin bred work horses for mining operations and in addition race horses for the growing Lüderitz. 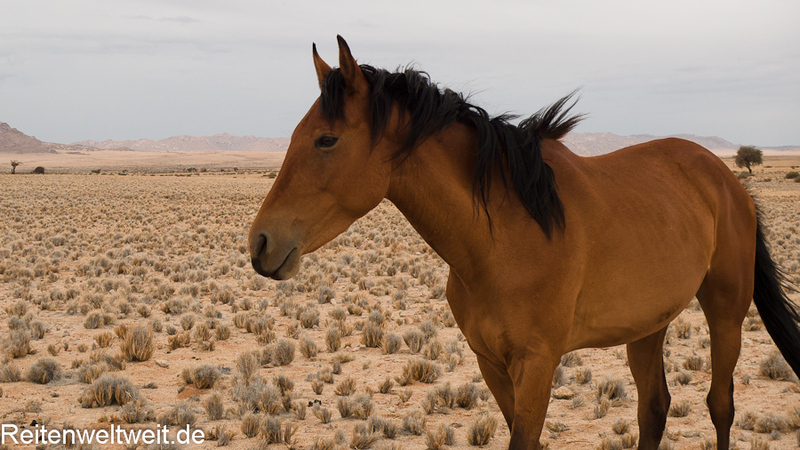 Photos of the stud horses of Kubub and Duwisib show remarkable similarities. Photos of the Kreplin breed show distinctive characteristics that are still prominent 90 years later in the wild horses of today. For the most part these features are characteristic of the Cape Boer Horse, Hackney, and Trakehner. 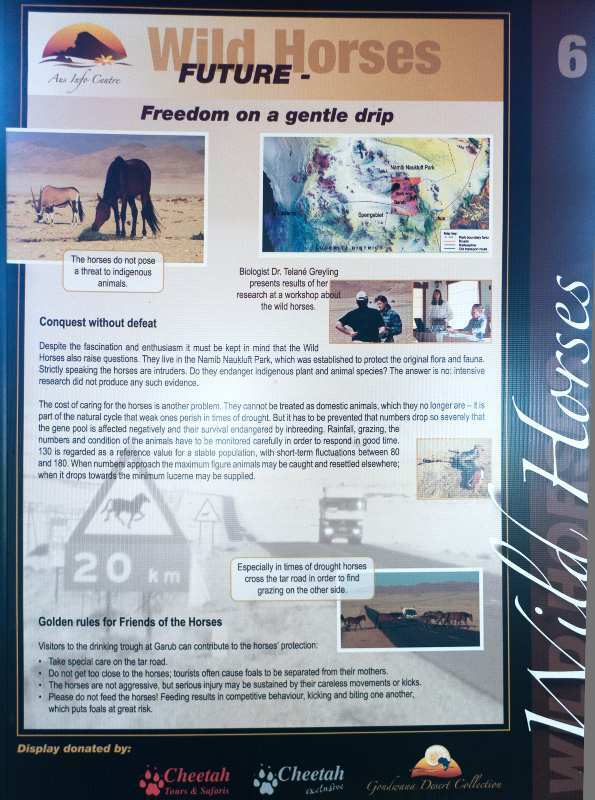 Consequently, we can say that the core of the herd consisted of horses of the South African army, the German troops, and the Kreplin studs (with connection with the breeding station of Hansheinrich von Wolf at Duwisib Castle) that fled to freedom after a bombing attack. 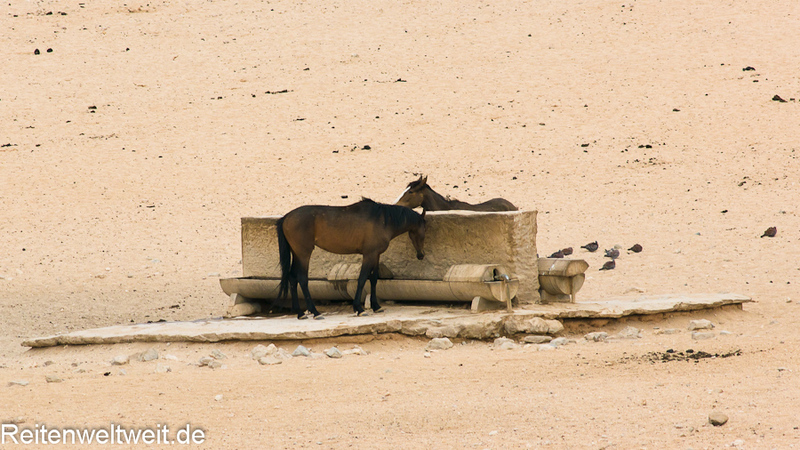 The scattered and abandoned horses congregated in the mountains around Aus where many natural watering holes exist. As there were no fences at that time, additional abandoned horses might have joined later during the Depression and the time of the automobile boom. Over time they learned to withstand the extremely hot conditions and were able to survive without human intervention. It becomes evident in this story that these Namib Horses, just as the Mustangs of the USA or the Brumbies of Australia are not “true” wild horses: They descended from German domestic horses and developed further to adjust. Physically they hardly differ from any regular horse. 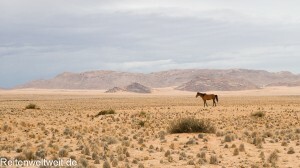 How were these Namib Horses able to survive? 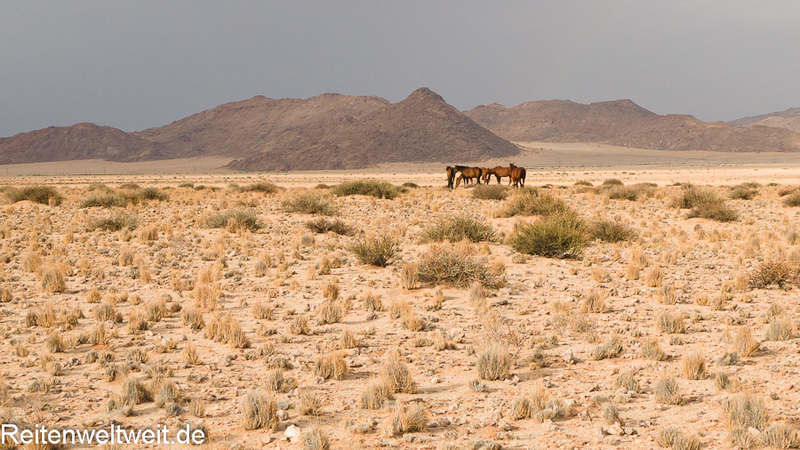 We must say: Namib Horses had a real guardian angel. Purely by coincidence diamonds were found around Kolmanskop (near the port city Lüderitz) in 1908. Consequently the German colonial administration created a restricted area which extended up to 100 km inland and was off-limits. 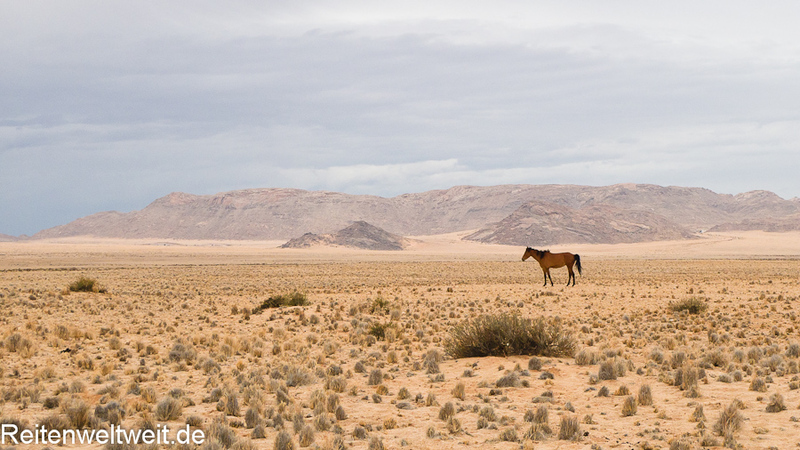 For the next 80 years the Namib herds were able to live undisturbed and free of human interaction and learned to adapt to the harsh conditions of a desert. Another stroke of luck helped them survive: The dug well watering hole near Garub which supplied water for the nearby steam engines. 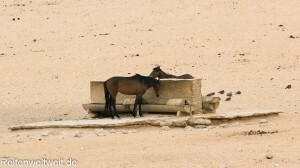 Enough water was always left to provide an adequate supply for the horses so they didn’t die of thirst. In 1986 the mining company turned 350 square kilometer of the restricted area over to nature conservancy. 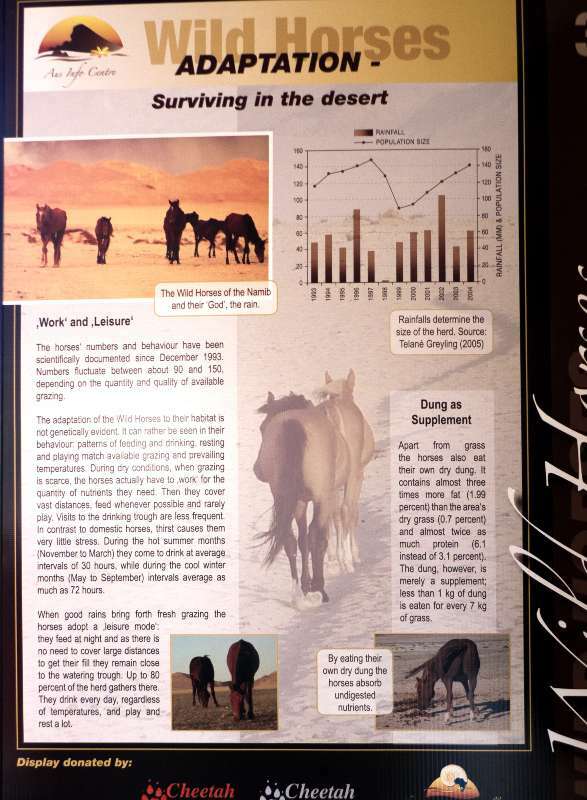 This saved the habitat and the future of these horses. 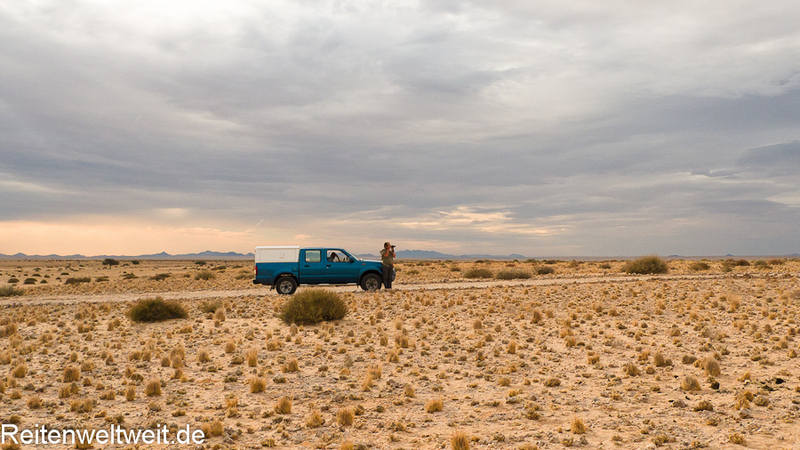 The area around Garub, which had been the Diamond Restricted Area 2 was incorporated into the Namib Naukluft Park. To get an assessment of the herd size the animals were first counted in 1985. 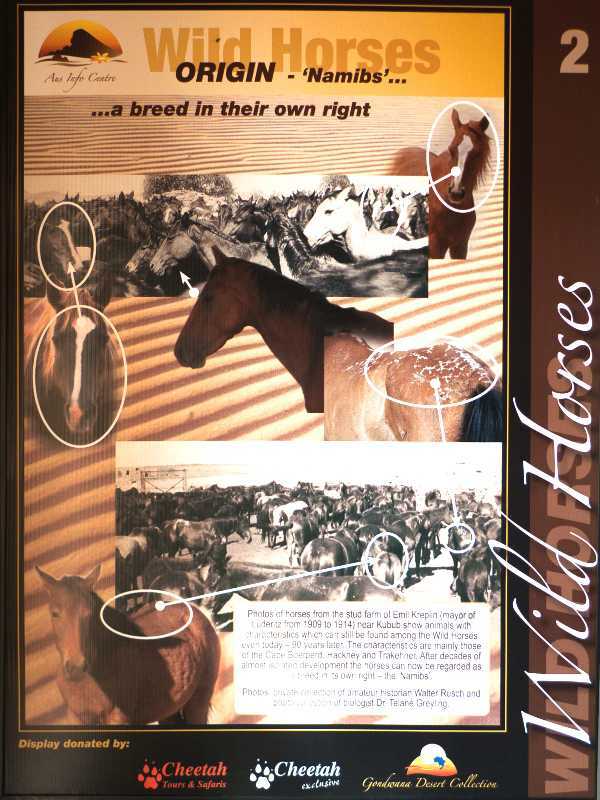 Since then the horse population has fluctuated from 89 to 280 animals. Drought conditions can account for these fluctuations and are quite normal. 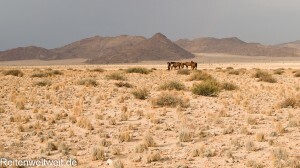 Where can Namib Horses be observed today? In southern Namibia observation of the Namib Horses by now contributes greatly to the region’s economy. People are excited about these wild animals and their generally slow and unhurried way of moving – it helps them preserve energy in these hot temperatures. Doubtless these horses always look imposing and powerful, especially so when the strong stallions’ many muscles glisten in the sun. 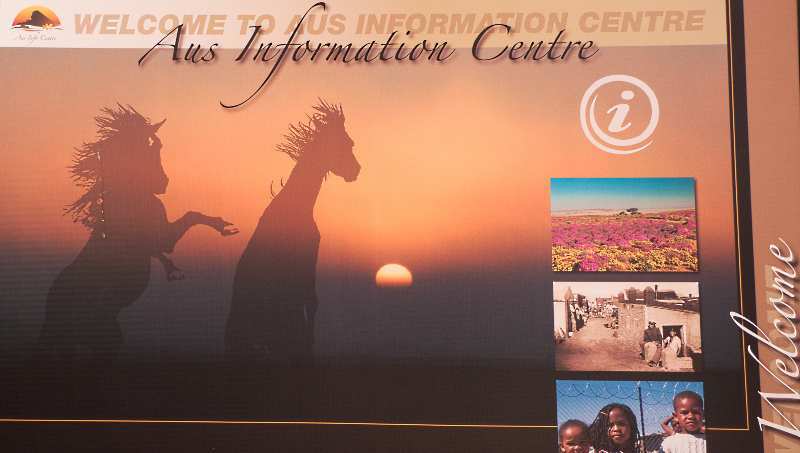 If you would like to to know more about the wild horses before you see them, visit the newly built Info Centre in the town of Aus where a poster display gives you background information about the life and history of these formidable animals. Of course, you shouldn’t miss out on observing the animals up close. To do just that take National Route B4 from Aus to Lüderitz. 20 miles past Aus take a small gavel road on your right (suitable even for regular cars). This path leads to the watering hole near Garub, where the horses come to drink often and where they can be observed. There is even a wooden shelter there so that the visitors can protect themselves from sunburn. 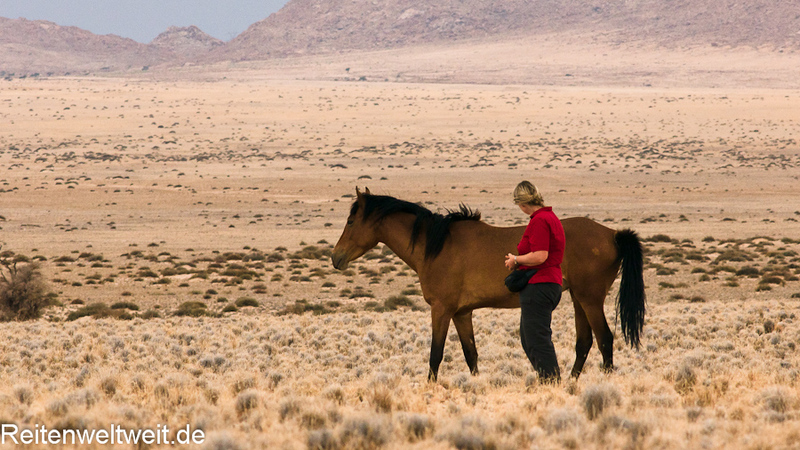 A real-life visit to observe the wild horses is definitely a most incredible experience! * Garub at one time was a small train station on the railroad between Aus and Lüderitz that was built in 1906. Lüderitz didn’t have its own drinking water and so barrels of water were transported on the railroad from Garub to the coast (120 km distance). Later Lüderitz received a water line and in 1990 the train station in Garub was closed. 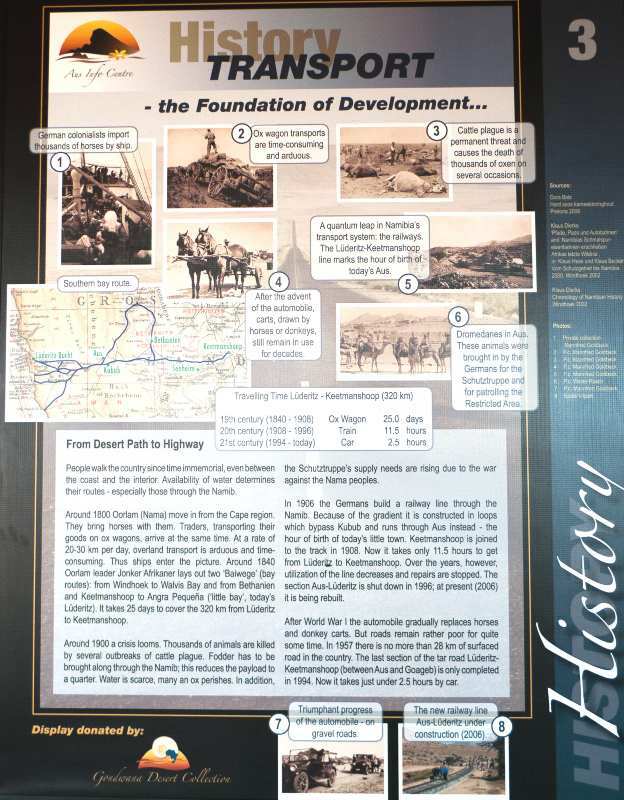 You can visit the small railroad station to this day. 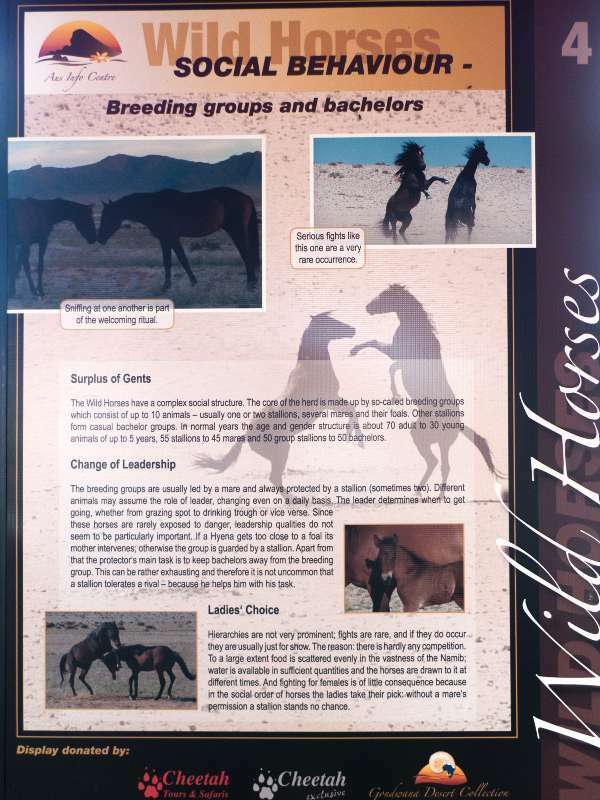 what a wonderful piece on these wild horses in the face of our sad situation of our american wild horses. i pray our country would treat our wild horses as well.